Sick of opening your computer to more bad news? Media censorship got you down? Read and written one too many rants against the Government? Take the frustration out on the dancefloor and raise some funds to make a real difference with some of your favourite bands and DJ’s, not to mention a very special visit from Iran’s King Of Pop himself – MICHAEL JACKSON!!! 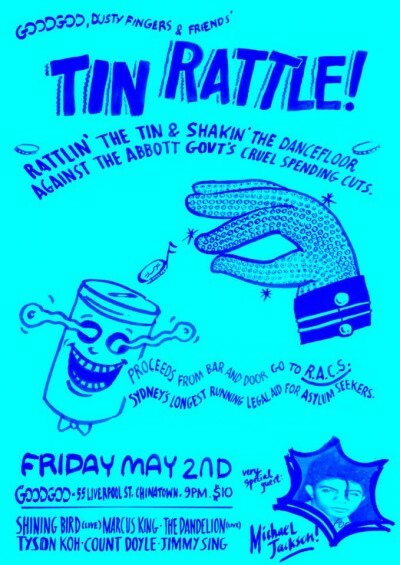 Proceeds from the door and bar will be going to RACS, Sydney’s longest running legal aid and case work organisation for refugees and asylum seekers. Sadly RACS just had their funding cut by the Abbott Government. This will have immediate and significant consequences for their work towards protecting the vulnerable men, women and children they assist. Unless RACs is able to establish a broad base of community support, this important and long standing institution will cease to exist. They do some amazing humanitarian work navigating Australia’s increasingly hostile stance to asylum seekers, so let’s help them out in the funnest way possible!